Regardless of the types of animals you raise on your farm, complacency and the feeling of being safe in their presence may leave you off guard. Injuries usually occur when the victim does not expect it and all animals should be considered unpredictable. A lack of knowledge of animal behavior could put a handler into dangerous situations. Thousands of animal related injuries occur each year, some even resulting in death. Don't overlook the importance of safety around livestock, particularly with inexperienced employees and family members. Some of the most common injuries include being stepped on by large animals, being knocked down , kicked, thrown while riding, or pinned between the animal and a hard surface. Many injuries also occur each year from bites. What can you do to prevent animal injuries? Proper equipment and handling facilities for your type of operation are a must. Larger animals, in particular need equipment that is able to restrain them for general maintenance or health care. Pens should be equipped with a man-gate or other means egress if necessary. Crowding animals into sorting or working chutes should be done with crowd gates, not with drivers. Catwalks along chutes and alleys eliminate the need for working in the alley. If the catwalk is more than 18" or so off the ground, it should be protected by a guardrail to prevent falls. Walking or working surfaces should be free of tripping and slipping hazards for both animals and workers. Eliminate protrusions and sharp corners. Lighting in handling and housing facilities should be even and diffused. Bright spots mixed with shadows in alleys and crowding pens will often cause cattle to balk. Guard the moving parts of a hydraulically operated squeeze chute and tilt table. Use solid panels for moving swine. Loading ramps and handling chutes ideally should have solid side- walls to prevent animals from seeing outside distractions with their wide-angle vision. Blocking vision will also help stop escape attempts. Sight reduction also lowers stress levels, thus having a calming effect on the animal. 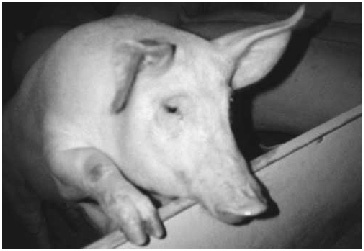 Pigs, sheep, and cattle have a tendency to move from a dimly lit area to a more brightly-lit area, provided the light does not hit them directly in the eyes. A spotlight directed on the ramp will often help keep the animals moving. Loud, abrupt noises, such as the sound of banging metal can cause distress in livestock. You may wish to install rubber bumpers on gates and squeeze chutes to reduce noises. The sense of smell is extremely important to animals, especially between females and newborns. Often animals react to odors we do not detect. For example, sheep may be lured by the smell of freshly mown hay or a bull may become aggressive when he detects a cow in heat. Handling facilities should be painted in one color only, since all species of livestock are likely to balk at a sudden change in color or texture. All livestock tend to refuse to walk over a drain, grate, hose, puddle, shadow, or any change in flooring texture or surface. All these factors need to be considered when evaluating or planning livestock handling facilities. To reduce the risk of falls, provide slip-resistant footing for workers and livestock with roughened concrete ramp and floor surfaces. Animals experience hunger, thirst, fear, sickness, injury and strong maternal instincts. They also develop individual behavior patterns such as kicking or biting. The handler should be aware of these behaviors and take necessary safety precautions, include using personal protective equipment. 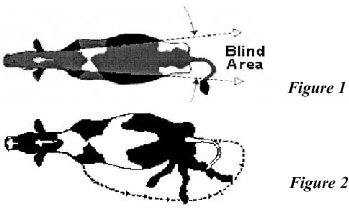 Beef, swine and dairy cattle are generally colorblind and have poor depth perception. This results in an extreme sensitivity to contrasts, which may cause an animal to balk at shadows or rapid changes from light to dark. Sheep are also considered colorblind, but do have good depth perception. Instead, Sheep have difficulty picking out small details, such as the open space created by a partially opened gate. Horses and Mules commonly kick toward their hindquarters, while cow's kick forward and out to the side Cows also have a tendency to kick toward a side with pain from inflammation or injuries. 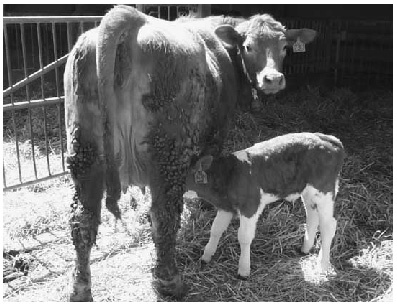 For example, if a dairy cow is suffering from mastitis in one quarter, consider approaching her from the side of the non-affected udder. Livestock with young exhibit a maternal instinct. They are usually more defensive and difficult to handle. When possible, let the young stay as close to the adult as possible when handling. Most animals have a strong territorial instinct and develop a very distinctive, comfortable attachment to areas such as pastures and buildings, water troughs, worn paths and feed bunks. Forcible removal from these areas can cause animals to react unexpectedly. 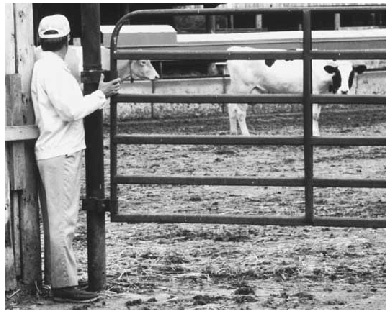 Considering these animal traits, it is easy to understand why animals often hesitate when going through unfamiliar gates, barn doors, and handling and loading chutes. Similar problems occur when animals are moved away from feed, separated from the herd or approached by an unfamiliar person. Moving or flapping objects can also disrupt handling. A cloth or coat swinging in the wind or turning fan blades can cause animals to balk. Movement at the end of a chute can cause them to refuse to be herded. Yelling should be kept to a minimum when working with livestock to enable the animal to feel secure. Be cautious around animals that are blind or deaf on one side. They favor that side and can suddenly swing around to investigate disturbances. If standing too close, a person could easily be knocked down and trampled. Animals respond to the way they are treated and draw upon past experiences when reacting to a situation. For example, animals that are chased, slapped, kicked, hit or frightened when young will naturally fear being approached. Personal Protective Equipment appropriate to the work situation should be worn. This could include safety glasses, gloves, long trousers, steel-toed shoes or boots, shin guards and a hard hat. It is also important to wear the proper footwear when around livestock. Footwear that supplies the proper foot support and protection is essential. For instance, one misplaced hoof of a 1500-pound cow can easily break the bones of the human foot encased in a pair of running shoes. Handlers should also be concerned with zoonotic diseases, which are illnesses that can be transmitted between humans and animals. Leptospirosis, rabies, brucellosis, salmonellosis and ringworm are especially important. The proper approach to a large animal is critical to working with them safely. Most large animals can see at wide angles around them, but there is a blind spot directly behind their hindquarters beyond which they cannot see. Any movement in this "blind spot" will make the animal uneasy and nervous. A frightened cow or horse will plow right over you. It is safer to use proper handling facilities made specially for separating large animals. Most animals will be more cooperative in moving through a chute that has minimal distractions. When you are inside a handling facility or milking lane, always leave yourself a way to get out if it becomes necessary. Try to avoid entering a small area enclosed with large animals unless it is equipped with a mangate that you can get to easily. Never prod animals if they have no place to go. Accidents with beef cattle tend to occur while the victim is handling the livestock. Beef cattle are known for an even disposition, but can startled, and inflict injury to anyone in their way. Groups of animals are easy to "spook." Bovines can see nearly 360 degrees without moving their heads. 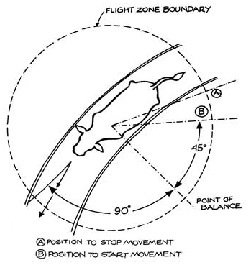 Therefore, a quick movement behind is just as apt to "set them off" as a frontal one. Dairy cows may look contented in the pasture, but they are generally more nervous than other animals. Creatures of habit, they are easily startled, especially by strange noises and persons. Always announce your presence when approaching a cow. Gently touch the animal rather than let the first contact be a bump or shove . When moving cows into a constraining space such as a milking parlor stall or squeeze chute, give them time to adjust before starting the work at hand. If a cow tends to kick, consider using a hobble. Don't permit workers to talk loudly, clatter and bang equipment around or handle cows roughly. Gentle cows can become dangerous when defending calves and this fact should be impressed to children, visitors and new workers. Special facilities should be provided so that a bull can be fed, watered, exercised and used for breeding without the handler coming into direct contact with him. Once you have moved dairy cattle into the milking stalls, give them a moment to adapt to the new environment before beginning your operation. Although cattle are not apt to attack you, they can overwhelm you with their size and weight. Leave yourself an "out" when trying to corner or work with cattle. Keep small children and strangers out. Beware of the area in front of the rear leg when working with cattle. They tend to kick forward, then back. Pulling the kicking leg forward can be used as a means of preventing a kick while working in the udder or flank area range. Though hogs are not normally aggressive animals, they can become dangerous animals if threatened, especially sows protecting her young. The best method by which to move hogs is by guiding them with gates and/or panels. Veterinary work and treatment of pigs should be done only when they are separated from the sow, or when she is restrained in the crate or a separate pen. Your best safety aid for the jobs is a lightweight hurdle or solid panel with a handle attached. The panel should be slightly narrower than the alleys through which the animals are being driven. As with most animals, make yourself known quietly and gently to avoid startling your hogs. A knock on the door or rattling the door handle will usually suffice. Don't let small children reach through pens or fences to pet or feed hogs. Keep unauthorized people out of pens or away from the facility altogether. Bio security can be an important issue. For example, when it lifts its head and pricks its ears, it is focusing on something far away. The horse lowers its head when focusing on low, close objects. Keep these blind spots in mind and know where your horse's attention is focused so you do not scare it. Your horse's ears will give you clues; they will point in the direction in which its attention is focused. Ears that are "laid back," or flattened backward, warn you that the horse is getting ready to kick or bite. Always work with calm but deliberate movements around horses. Nervous handlers can make horses nervous, creating unsafe situations. When catching a horse, approach from its left shoulder. Move slowly but confidently, speaking to the horse as you approach. Read the horse's intention by watching its body language. Be careful when approaching a horse that is preoccupied, such as when its head is in a hay manger. When approaching a horse in a stall, speak to the horse to get its attention and wait until it turns and faces you before entering and make sure the horse moves over before you walk in beside it. Speak to your horse and keep your hands on it when moving around it. Even if a horse is aware of your presence, it can be startled by quick movements. When approaching from the rear, advance at an angle speaking to the horse, making sure you have its attention. Touch it gently as you pass by its hindquarters. Hold the lead line with your right hand, 8 to 10 inches away from the horse's head, while holding the end, or bight, of the line with your left hand. Always use a lead line so you have this "safety zone" and to prevent getting a hand caught in the halter. Teach your horse to walk beside you so that you are walking at its left shoulder, with your right elbow near the horse's shoulder so you can anticipate its actions. Do not let the horse "walk" you. Do not allow it to get behind you either, as it could jump into you if spooked. To lead a horse through a doorway, you should step through first, then quickly step to the side out of the horse's way. Keep an eye on it, as some horses try to rush through narrow spaces. Never wrap any piece of equipment attached to a horse around your hand, even with small loops, as it could wrap around the hand and cause serious injury. After you remove the halter, make the horse stand quietly for several seconds before letting it go completely. This will help prevent the horse from developing a habit of bolting away and kicking at you in the process. Some horses can become sour and begin nipping at you if they anticipate discomfort during grooming. Do not hurry the grooming procedure, especially with a young or spooky horse. Stay near the horse and keep a hand on it at all times so you can anticipate its movements. Do not climb over or under the lead line of a tied horse. The horse may pull back and cause you to trip over the line, and you will have no quick escape should the horse lunge forward, paw or try to bite. Never walk under the belly of any horse. A common accident involving sheep is being butted by a ram. Ewes will also protect their young and should be handled carefully. A sheep can be immobilized for safe handling by sitting it up on its rump and the ground. Copyright © 2002 Farm Safety Association Inc. 22-340 Woodlawn Road West, Guelph, Ontario (519) 823-5600.